The iron shackles found on the Henrietta Marie illustrate the horrors of the Middle Passage. Africans were forced to wear these very devices, huddled below decks in the equatorial swelter, with the shackles indicating the beginning of a new life—one in which they would never be free again. Slavers restrained their captives to protect their profits. Africans often fought to escape or were desperate enough to jump overboard and drown themselves rather than remain imprisoned. There are also accounts of Africans freeing themselves and using the shackles as bludgeons during a ship-board rebellion. Constructed of two loops slipped onto an iron bar, these shackles are known as bilboes. They were used fasten two people together at the ankle, making walking difficult and running impossible, especially on a rolling deck. Usually, only the men were fettered, with women and children being allowed more freedom. Once the ship was out of sight of land and the prisoners had no hope of escape, all shackles were removed to prevent chafing and infection—damage to the merchandise—unless the prisoners were unruly. Over eighty pairs of shackles were found aboard the merchant slaver Henrietta Marie, indicating the probability that at least two hundred Africans were being transported. Various contemporary accounts suggest that there were serious uprisings on one out of every five Middle Passage voyages. Possibly one such crisis occurred on the last voyage of the Henrietta Marie. 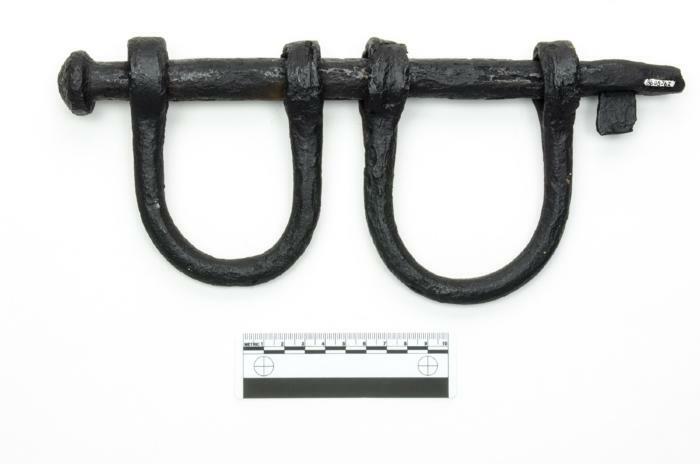 While there is no evidence that specifically points to such a rebellion, two loops from two different sets of shackles were found wrapped with cord, presumably for a cushioning effect to prevent chafing of the captives’ skin. What does this imply? Possibly that some of the Africans—men, to judge by the size of the loops—refused to be subdued and had to be restrained for the entire voyage. Additionally, there are a number of very small shackles, suggesting a high level of paranoia or cruelty among the crew, as well as the presence of people of all ages who at least momentarily resisted their captors.